In today’s solid state drives, the NAND flash memory must be erased before it can store new data. In other words, data cannot be overwritten directly as it is in a hard disk drive. Instead, SSDs use a process called garbage collection (GC) to reclaim the space taken by previously stored data. This means that write demands are heavier on SSDs than HDDs when storing the same information. This is bad because the flash memory in the SSD supports only a limited number of writes before it can no longer be read. We call this undesirable effect write amplification (WA). In a previous article, we explained why write amplification exists, but here I will explain what controls it. I often tell people that SSDs work better with more free space, so anything that increases free space will keep WA lower. The two key ways to expand free space (thereby decreasing WA) are to 1) increase over provisioning and 2) keep more storage space free (if you have TRIM support). overseeing all outbound marketing and performance analysis for the company. As I said earlier, there is no WA before GC is active. However, this pristine pre-GC condition has a tiny life span – just one full-capacity write cycle during a “fresh-out-of-box” (FOB) state, which accounts for less than 0.04% of the SSD’s life. Although you can manually recreate this condition with a secure erase, the cost is an additional write cycle, which defeats the purpose. Also keep in mind that the GC efficiency and associated wear leveling algorithms can affect WA (more efficient = lower WA). The other major contributor to WA is the organization of the free space. When data is written randomly, the eventual replacement data will also likely come in randomly, so some pages of a block will be replaced (made invalid) and others will still be good (valid). During GC, valid data in blocks like this needs to be rewritten to new blocks. This produces another write to the flash for each valid page, causing write amplification. With sequential writes, generally all the data in the pages of the block becomes invalid at the same time. As a result, no data needs relocating during GC since there is no valid data remaining in the block before it is erased. In this case, there is no amplification, but other things like wear leveling on blocks that don’t change will still eventually produce some write amplification no matter how data is written. 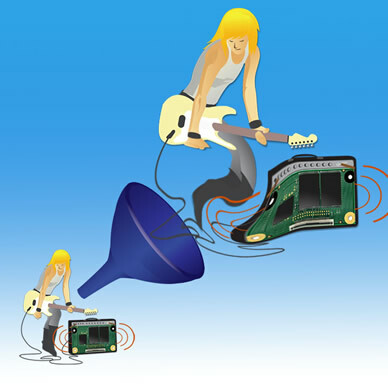 Write Amplification is fundamentally the result of data written to the flash memory divided by data written by the host. In 2008, both Intel and SiliconSystems were the first to start talking publicly about WA. At that time, the WA of all SSDs was something greater than 1.0. It was not until SandForce introduced the first SSD controller with DuraWrite technology in 2009 that WA could fall below 1.0. DuraWrite technology increases the free space mentioned above, but in a way that is unique from other SSD controllers. When does an amplifier make things smaller? The performance of all SSDs is influenced by the same factors – such as the amount of over provisioning and levels of random vs. sequential writing – with one major exception: entropy. Only SSDs with data reduction technology can take advantage of entropy – the degree of randomness of data – to provide significant performance, endurance and power-reduction advantages. Data reduction technology parlays data entropy (not to be confused with how data is written to the storage device – sequential vs. random) into higher performance. How? When data reduction technology sends data to the flash memory, it uses some form of data de-duplication, compression, or data differencing to rearrange the information and use fewer bytes overall. After the data is read from flash memory, data reduction technology, by design, restores 100% of the original content to the host computer. This is known as “loss-less” data reduction and can be contrasted with “lossy” techniques like MPEG, MP3, JPEG, and other common formats used for video, audio, and visual data files. These formats lose information that cannot be restored, though the resolution remains adequate for entertainment purposes. A previous discussion on data reduction (Read: Understanding SSDs: the need for TRIM and overprovisioning) discussed how data reduction technology relates to the SATA TRIM command and increases free space on the SSD, which in turn reduces WA and improves subsequent write performance. With a data-reduction SSD, the lower the entropy of the data coming from the host computer, the less the SSD has to write to the flash memory, leaving more space for over provisioning. This additional space enables write operations to complete faster, which translates not only into a higher write speed at the host computer but also into lower power use because flash memory draws power only while reading or writing. Higher write speeds also mean lower power draw for the flash memory. Each of these in turn produces other benefits, some of which circle back upon themselves in a recursive manner. 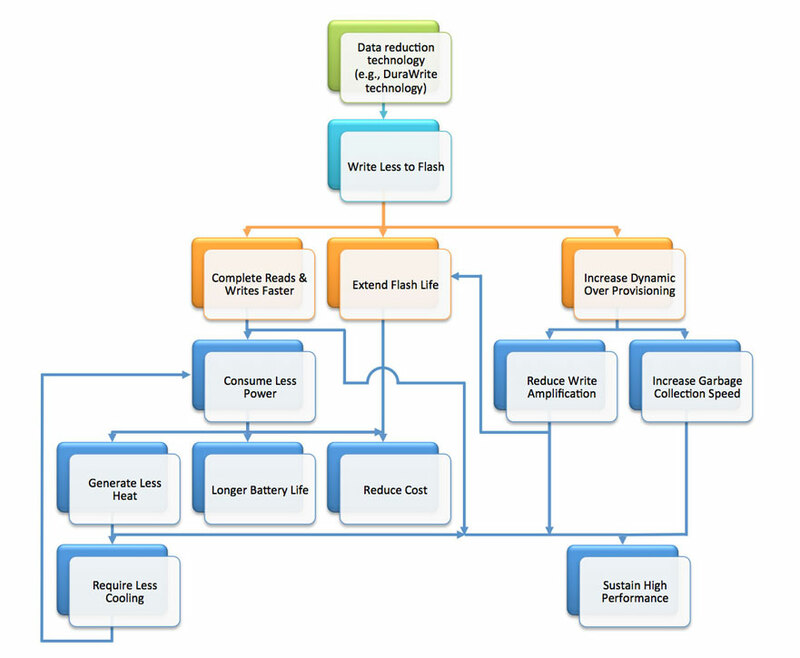 This logic diagram highlights those benefits. Click on diagram for expanded view. So this a rare instance when an amplifier – namely, Write Amplification – makes something smaller. At LSI, this unique amplifier comes in the form of the LSI DuraWrite data reduction technology in all SandForce Driven SSDs. Why is it important to know your SSD write amplification? Well, it’s not really necessary to know the write amplification of your SSD at any particular point in time, but you do want an SSD with the lowest WA available. The reason is that the limited number of program/erase cycles that NAND flash can support keeps dropping with each generation of flash developed. A low WA will ensure the flash memory lasts longer than flash on an SSD with a higher WA. A direct benefit of a WA below one is that the amount of dynamic over provisioning is higher, which generally provides higher performance. In the case of over provisioning, more is better, since a key attribute of SSD is performance. Keep in mind that, beyond selecting the best controller, you cannot control the WA of an SSD. Just how smart are the SSD SMART attributes? The monitoring system SMART (Self-Monitoring, Analysis and Reporting Technology) tracks various indicators of hard disk solid state drive reliability – including the number of errors corrected, bytes written, and power-on hours – to help anticipate failures, enabling users to replace storage before a failure causes data loss or system outages. Some of these indicators, or attributes, point to the status of the drive health and others provide statistical information. While all manufacturers use many of these attributes in the same or a similar way, there is no standard definition for each attribute, so the meaning of any attribute can vary from one manufacturer to another. What’s more, there’s no requirement for drive manufacturers to list their SMART attributes. Most SSDs provide some list of SMART attributes, but WA typically is excluded. However, with the right tests, you can sometimes extrapolate, with some accuracy, the WA value. We know that under normal conditions, an SSD will have a WA very close to 1:1 when writing data sequentially. For an SSD with data reduction technology, you must write data with 100% entropy to ensure you identify the correct attributes, then rerun the tests with an entropy that matches your typical data workload to get a true WA calculation. SSDs without data reduction technology do not benefit from entropy, so the level of entropy used on them does not matter. IOMeter provides multiple entropy types, but only IOMeter 2010 permits user selectable entropy for simulating real-world data environments. To measure missing attributes by extrapolation, start by performing a secure erase of the SSD, and then use a program to read all the current SMART attribute values. Some programs do not accurately display the true meaning of an attribute simply because the attribute itself contains no description. For you to know what each attribute represents, the program reading the attribute has to be pre-programmed by the manufacturer. The problem is that some programs mislabel some attributes. Therefore, you need to perform tests to confirm the attributes’ true meaning. Start writing sequential data to the SSD, noting how much data is being written. Some programs will indicate exactly how much data the SSD has written, while others will reveal only the average data per second over a given period. Either way, the number of bytes written to the SSD will be clear. You want to write about 10 or more times the physical capacity of the SSD. This step is often completed with IOMeter, VDbench, or other programs that can send large measurable quantities of data. At the end of the test period, print out the SMART attributes again and look for all attributes that have a different value than at the start of the test. Record the attribute number and the difference between the two test runs. You are trying to find one that represents a change of about 10, or the number of times you wrote to the entire capacity of the SSD. The attribute you are trying to find may represent the number of complete program/erase cycles, which would match your count almost exactly. You might also find an attribute that is counting the number of gigabytes (GBs) of data written from the host. To match that attribute, take the number of times you wrote to the entire SSD and multiply by the physical capacity of the flash. Technically, you already know how much you wrote from the host, but it is good to have the drive confirm that value. When you find candidates that might be a match (you might have multiple attributes), secure erase the drive again, this time writing randomly with 4K transfers. Again, write about 10 times the physical capacity of the drive, then record the SMART attributes and calculate the difference from the last recording of the same attributes that changed between the first two recordings. This time, the change you see in the data written from the host should be nearly the same as with the sequential run. However, the attribute that represents the program/erase cycles (if present) will be many times higher than during the sequential run. With sequential transfers, this number should be very close to 1. With random transfers, the number will be much higher depending on the SSD controller. Different SSDs will have different random WA values. If you have an SSD with the type of data reduction technology used in the LSI SandForce controller, you will see lower and lower write amplification as you approach your lowest data entropy when you test with any entropy lower than 100%. With this method, you should be able to measure the write amplification of any SSD as long as it has erase cycles and host data-written attributes or something that closely represents them. The key point to remember is that write amplification is the enemy of flash memory performance and endurance, and therefore the users of SSDs. In this article we examined all the elements that affect WA, including the implications and advantages of a data reduction technology like LSI SandForce's DuraWrite technology. Once you understand how WA works and how to measure it, you will be better armed to defend yourself against this beastly cause of degraded SSD performance. Kent Smith is senior director of marketing for LSI’s Flash Components Division, overseeing all outbound marketing and performance analysis. Prior to LSI, Kent was senior director of corporate marketing at SandForce, acquired by LSI in 2012. His more than 25 years of marketing and management experience in computer storage and high-technology includes senior management positions at companies including Adaptec, Acer, Polycom, Quantum and SiliconStor.